The two best finds exhibited in the museum are the marble statues of Artemis. One is from the first century AD and the other second century AD. Rows of egg-shaped marble pieces on the goddess's chest have been interpreted differently as breasts, eggs, grapes or dates. In 1978 a new interpretation suggested that these pieces on the goddess's chest were bulls' testicles offered to her on feast days as symbols of fertility. Later excavations proved that the bull cult was really important. Similarly to Mother Goddess of Anatolia, she has two feline animals standing next to her. Head of Socrates is dating back to 4th century BC. Socrates had 2 wifes and he was constantly having arguments with his first wife who was a very mean woman. Socrates blessed her bachelor friends by saying "Get yourselves a wife: if she is good' you will be happy' if she is bad, you will become a philospher"
Important Notice: Ephesus Archaeological Museum went under restoration and will be closed funtil June 2014 ! A new excavation site. Excavations are still going here. 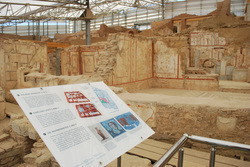 In a week day visitors can see the archaeologists working. It has been open for public visits for the last 5 years. Archaeologisits have been excavating 7 houses owned by the richest Ephesians. These were high ranking officers, governors and rich trades man. The size of the homes are starting from 1000 square feet and the largest one was 6000 square feet. They date back to the 1c. AD and some of them were used up to the 7C AD. Many of them were two storied houses and had peristyles Peristyle meaning that each home had a courtyard surrounded by rooms without windows. Above the courtyard there was an opening for fresh air and when it rained, rain water was collected either in a pool or a well. Floors of the homes were decorated with marble and mosaics. The walls with stucco having mythological scenes. They were luxuriously furnished private houses with fountains, private baths and central heating. Between the street and houses was a portico with a mosaic floor, behind which were shops. Their homes were single family homes. Homes were made, quite often, of brick with red tile roofs, with rooms arranged around a central courtyard. The windows and balconies faced the courtyard, not the street, to keep homes safe from burglars. There was very little furniture, and no carpeting. Wealthy Romans might have a house with a front door, bedrooms, an office, a kitchen, a dining room, a garden, a temple, an atrium, a toilet, and a private bath. Vsitors who would like to visit this site should expect so many steps going up and going down. You will be walking on some transparent floors which enable you to see the below. Million of US Dollars are spent for these excavations. A special fiber above the complex avoid the sun light which could fade the stuccos. There is an extra admission of 15 TL (11USD) to visit this extraordinary site.